DC motor armature mechanical torque (Tm) calculator - step by step calculation, formula & solved example problem to find the armature mechanical torque produced by an electrical DC motor. Field constant Ka, armature current Ia & (EMF) flux generated by the magnetic field φ are the key elements in this calculation. The below step by step solved example problem may helpful for users to understand how the input values are being used in such calculations to find the armature mechanical torque (Tm) of DC motor. 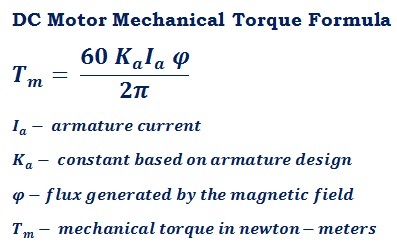 Find the armature mechanical torque (Tm) of a DC motor whose field constant Ka = 0.0025, armature current Ia = 0.75 amps & (EMF) flux generated by the magnetic field φ = 250 weber. In the field of electrical engineering, while changing the armature current, field constant & EMF, it's required to calculate the armature mechanical torque of a DC motor. The above formula, step by step calculation & solved example problem may be useful for users to understand how the values are being used in the formula to find the armature mechanical torque (Tm), however, when it comes to online for quick calculations, this calculator helps the user to perform & verify such calculations as quick as possible.